Bullying victims are made, not born. Learn how to step into your own power peacefully! 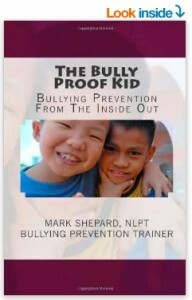 Author Mark Shepard, a former bullying victim, suffered for years at the hands of bullies until he learned how to Bully Proof himself. Packed with proven tips, tools, tactics, techniques and resources that work from the classroom to the boardroom. What if everything that has ever happened in your life was exactly the right thing at the right time in the right way? How would believing that change your current experience of the world? This book is designed to guide you through a new way of perceiving your life that gives you the ultimate power to transform your world. Now. Looking to get off the diet roller-coaster and create the body and life you want? Master Practitioner and Trainer of Hypnosis and NLP, Mark Shepard shares his secrets from over 10 years of private practice helping people stop being the victims of their compulsive eating habits.